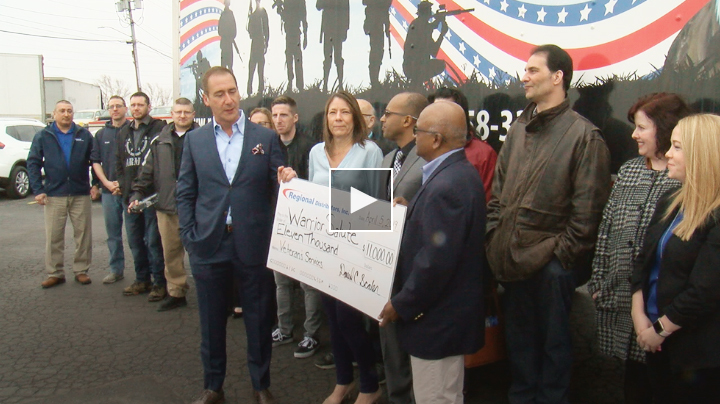 Rochester, NY - Regional Distributors, Inc., a NYS Certified Women’s Business Enterprise (WBE) and #41 on the 2018 Rochester Top 100 list, was proud to present a check donation on Friday, April 5, 2019 for $11,000.00 to Warrior Salute Veteran Services, a CDS Life Transitions company and local military veteran support organization that provides clinical and rehabilitative therapies, transitional housing and family and community support services. Owners Tracy Scalen, President & CEO, David Scalen, Executive Vice President, and employed veterans of Regional Distributors, Inc. were proud to present an $11,000.00 check donation to Sankar Sewnauth, CDS Life Transitions President/CEO, Thomas DeRoller, CDS Wolf Foundation Executive Director, CDS and Warrior Salute management and, most importantly, veterans enrolled in Warrior Salute’s progressive program (see 13WHAM's coverage). 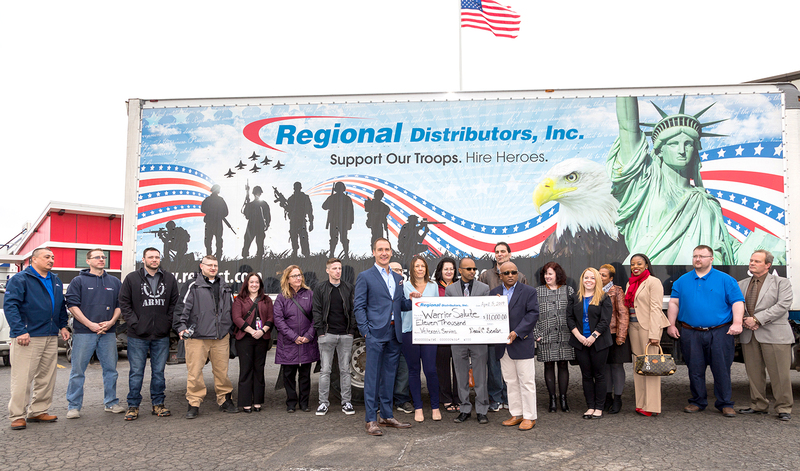 The donation marks the third annual donation given by Regional Distributors, Inc. to Warrior Salute Veteran Services with a total of $27,000.00 donated to date. “We are so grateful for organizations like Regional Distributors, Inc. who understand that there is a great need in our country to provide support and assistance for our veterans. I would like to extend my sincere appreciation to Tracy and David Scalen, for their continued support and generous donation to Warrior Salute Veteran Services. This donation allows us to continue providing the critical supports our service men and women need and deserve," shares Sewnauth. Enhancing the quality of life and supporting U.S. military veterans’ transition back to civilian life is an important mission for Regional Distributors, Inc. Our Valor & Victory line of advanced commercial cleaning and dish machine chemicals provides a long-term opportunity for us and our customers to give back to military veterans and combines our professional passion with our personal duty to supporting veterans in the Greater Rochester community. Businesses have the opportunity to give back to military veterans through support of the Valor & Victory line where a portion of proceeds is donated to Warrior Salute Veteran Services that helps military veterans with post-traumatic stress disorder (PTSD), traumatic brain injury (TBI), and military sexual trauma (MST). Tracy Scalen decided that Warrior Salute was the organization she wanted to partner with after touring their facilities in Webster, NY. "Warrior Salute's progressive program and personalized, comprehensive services are unlike any veteran support program I've come across. They work one-on-one with veterans and their families to regain their lives and synthesize specific psychological, social, and vocational goals to ensure each veteran has a rewarding and fulfilling transition back into community life," shares Scalen. Supporting military veterans is a mission that resonates strongly with Regional's customers and particularly with owners Tracy and David Scalen as both their families have a history of military service. “Both of my parents were in the Marine Corps and David's father was a World War II Army veteran and suffered from post traumatic stress disorder,” shares Tracy Scalen. “Supporting our military vets is a personal and professional passion of ours and we continuously explore new opportunities that allow us to give back to our veterans." With support from customers and business community members, Regional Distributors, Inc. plans on donating annually from Valor & Victory proceeds and related fundraising events to help military veterans regain their lives and dreams by supporting Warrior Salute’s quality clinical and rehabilitative therapies, employment opportunities, temporary housing, and support services. Tracy Scalen states, "Many of our customers, and most of us in general, have a family member that was or is a veteran. We all know the hardships they've endured while serving and, for some, those hardships continue after service. The Valor & Victory line is a simple way for our customers to honor veterans and help them regain their lives through the outstanding services provided by the Warrior Salute program." With help from Regional's own military veteran employees, all of the products in the Valor & Victory line were designed and named to honor military veterans and represents a simple, but inspired way to recognize the service and sacrifice of military veterans and their families. Products are named after common military terms and technologies, such as Double Time Chlorinated Dish Machine Detergent and Liberator Cleaner & Degreaser. Product labels also include icons that visually reflect each product's military-related name, as well as common cleaning visuals, such as water and reflective design elements, and standard warewashing chemical color coding. In addition, truck graphics were created to promote the new line and complement the company's already existing and award-winning "Hiring Heroes" truck graphics. 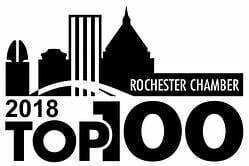 A "Be Loyal, Be Proud, Buy Local" icon and Greater Rochester Chamber of Commerce member logo are proudly included on the truck graphics to remind community members to support Rochester businesses, city services, and overall local economy. 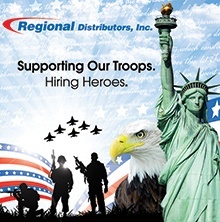 Regional Distributors, Inc. is family-owned and NYS Certified Women's Business Enterprise (WBE) that delivers a streamlined source for janitorial, paper, food service, packaging, laundry, warewashing, ice cream, frozen yogurt, and environmentally responsible products, solutions, and services. We partner with our customers to deliver efficient solutions to assist in the development and promotion of sustainable practices to preserve the environment, minimize health risks, and reduce costs, labor, and resources. Our progressive, technology-driven products and processes not only address time- and cost-savings obstacles, but also raise cleanliness and health standards resulting in positive perceptions and experiences for occupants and guests. Exceptional levels of reliable service, trusted products from the world’s leading suppliers, and constant innovation leveraging technologies has made Regional a valued partner to 2,500+ diverse customers who demand efficient commercial products that meet unique business needs and customer service that not only exceeds, but transforms expectations. Warrior Salute Veteran Services is a progressive program that helps military veterans with post traumatic stress disorder (PTSD), traumatic brain injury (TBI), and military sexual trauma (MST). Warrior Salute assists veterans and their families regain their lives and dreams by providing employment opportunities, clinical and rehabilitative therapies, and family support services. Staff and case managers work one-on-one with veterans and their families to help identify their goals, determine the personalized support needed, and implement the programs and training necessary to foster growth and development as they transition back into the community. The Nucor House is a residential treatment facility, offering veterans 24/7 care from staff and support from their peers, to provide the ideal setting for consistent clinical treatment. For more information, please visit www.cdswarriorsalute.org. Join our enthusiasic and dynamic team dedicated to excellence. View current employment opportunies.